Catherine PS3 Review. This is definitely a title for lovers of puzzles… and more specifically, difficult puzzles! Catherine is probably one of the most unique games to be released on the PlayStation 3 in quite some time as it definitely strays from the traditional gaming norm. In essence, the game is a devious puzzle thriller on the PS3 that contains a colourful yet interesting romantic horror theme with a truly emotional protagonist. It's definitely not your average PS3 game and because of this, the end result is relatively impressive. The protagonist of Catherine is 32-year old Vincent Brooks who is torn by his own emotions and desires, especially when it comes to his relationships. As a result he is plagued by gruesome nightmares which have the power to take his life and it seems that these nightmares have led to a string of deaths of single young men. The game is also beautifully presented like an anime story with its stylised animation that looks amazing in FULL HD as opposed to the relatively harsh gameplay. In the game, Vincent is your average man and although he doesn't have any delusions of grandeur, he becomes involved in a deadly game with two women. His girlfriend during the day is the loyal Katherine who desperately wants to marry her lover and may even be pregnant, however Vincent feels anxious about this long term commitment. This is where the "other" girl Catherine comes into the picture where he meets her at a bar called The Stray Sheep. Unlike Katherine, Catherine is the party girl who believes in freedom and having a good time now and to hell with the consequences. Regrettably for Vincent, he breaks his commitment to Katherine and awakes next to the beautiful blonde seductress Catherine in his bed. To make matters worse apart from the strange dreams that he is having, he discovers that this Catherine is far from the fun loving girl that he desired as her jealous nature is unleashed upon Vincent. Needless to say if Vincent cheats on Catherine, there will be hell to pay! Vincent is now in a dilemma and it's up to the player to help him solve this problematic situation through some carefully laid questions throughout the game. With a lack of sleep and a potential psychopath that plagues both his waking and sleeping moments, the anxiety soon starts to build and he becomes a shell of the former man he was. 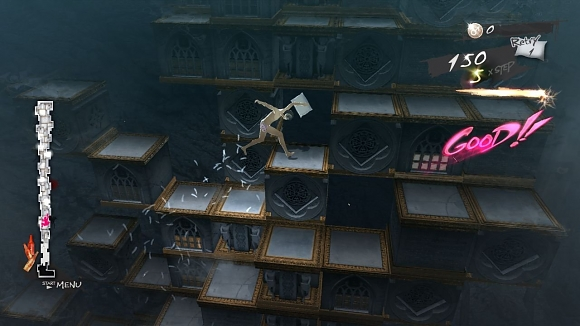 With a healthy amount of cinemas, the key aspect to Catherine is the bizarre puzzles that at times are reminiscent of the original Prince of Persia game. These gaming moments take place in the dream world that often involve sheep and demons where if you make the wrong move, it could mean the difference between life and death. However in the waking world, the player does have the choice to make moral or immoral decisions that does effect how the gameplay will play out and is actually quite a psychological ride for the player. This "choice" actually gives the player 8 ways of finishing the game. 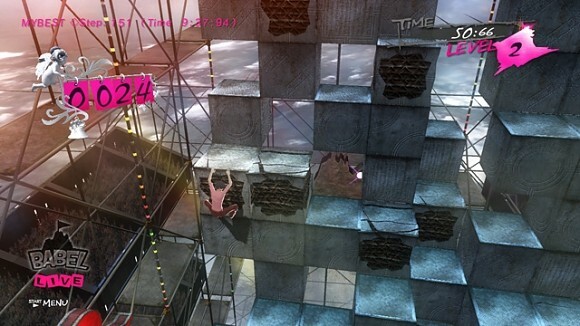 The main gameplay of Catherine is rather quite simplistic as you need to climb blocks up a tower in order to reach the exit. Unfortunately this is easier said than done and as you climb, you soon realise that you will face a variety of obstacles. In order to bypass these obstacles, blocks must be pushed and pulled in order to make stairways to each the top. As you progress the blocks become more and more dangerous and opposed form the crumbling blocks early in the game, these soon change to torture and ice blocks to name a few of the obstacles that you face. And then you have the enemies and the boss battles. Boss battles can be quite insanely difficult at times, even on the normal level of the game because not only must you contend with the obstacles in the tower but also the attacks from the boss. I must admit that I did get inundated with controller rage in Catherine; especially early on as the control system did seem a little stiff and fiddle some… not to mention those horrible camera angles. Fortunately there are a few spawn points on the tower should you fall and items also assist in progress such as pillows that server as extra lives. Another positive of Catherine is that every level can be played differently but as some levels are extremely difficult to complete, this title will definitely be a one play game for most, even with the inclusion of a score based system in the game. There is an online leaderboard system to publish your scores and I was quite surprised at how fast some of these levels were finished. 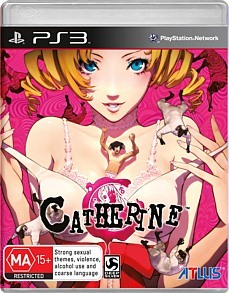 But with that said, Catherine is a thoroughly frustrating experience that is not for the faint hearted. Graphically, the cutscenes look gorgeous, especially with the authentic Japanese anime that enhance the overall gameplay. 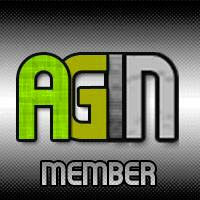 The in-game graphics are a little bland but there's some decent special effects and lighting to help break things up. The bosses also look like quite bizarre in this demon and lustful type of way. Music is just as good thanks to Shoji Meguro (Shin Megami Tensei) which gives the title a very surreal soundtrack, especially with all the love and hate around Vincent. Voice acting is equally as enjoyable as it enhances the overall anime experience. As mentioned, this game is not your norm as it's heavily puzzle orientated so unfortunately that will cause this game to find a niche market. Given that the puzzles can be excruciatingly deviant at times, rage controller is another aspect of this title that will sway some people for playing it. 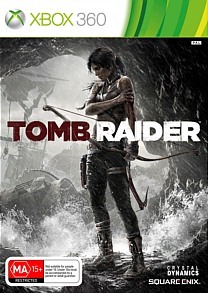 With that in mind, I found this game one of the most frustrating titles that I have EVER played on the PS3. I’m still screaming at the game! However as I followed Vincent in this psychological tale, I found the puzzles once completed quite rewarding and generally the answers are staring you right in the face. This is definitely a title for lovers of puzzles… and more specifically, difficult puzzles!